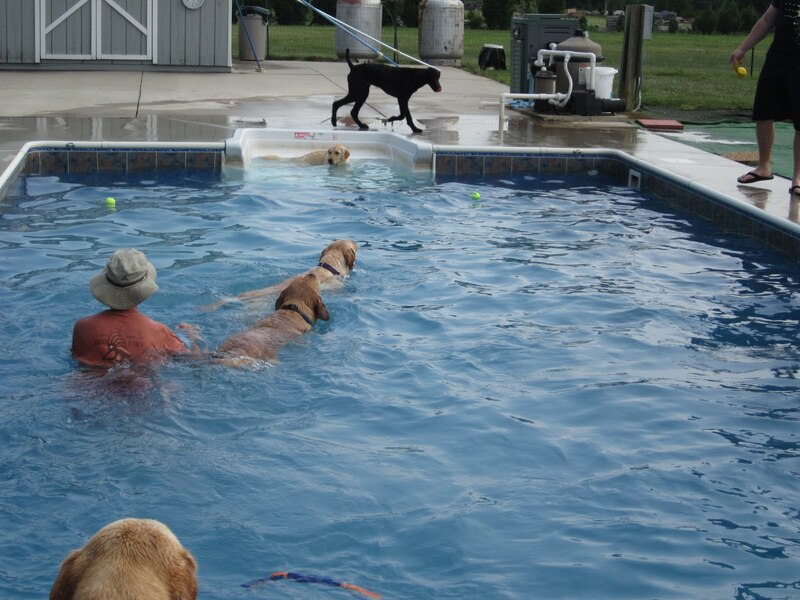 Saturday was the perfect day for a swim, and that's exactly what some of our puppy raisers did with their dogs! 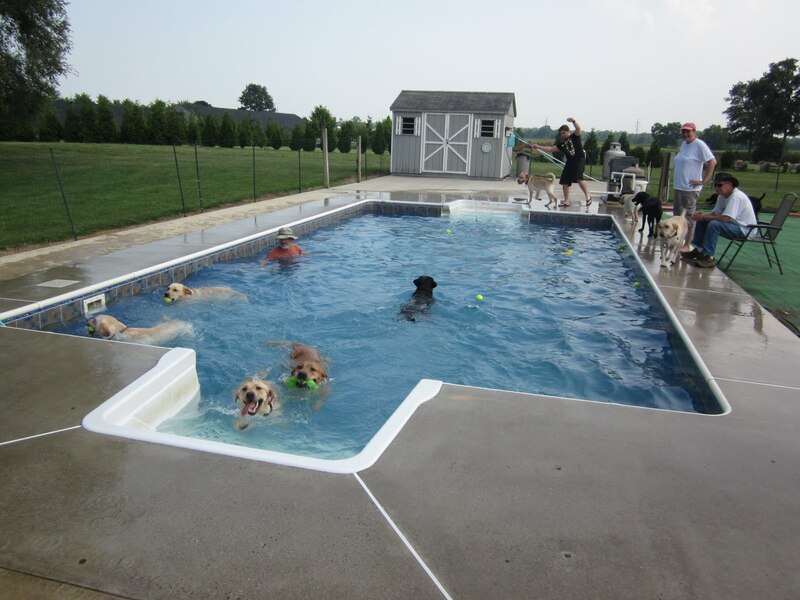 We went to Sun Hill Kennels, where they have an outdoor pool just for dogs, as well as half an acre of fenced-in land for the dogs to run. Sun Hill Kennels donated two hours of pool time to SSD so our dogs could enjoy the pool. And they certainly loved it! 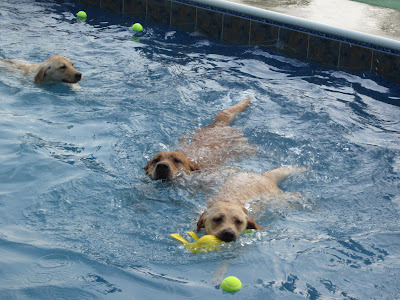 They wore themselves out jumping into the water after tennis balls and other toys, and when they needed a break from swimming, they chased each other around the yard. It was a great afternoon! 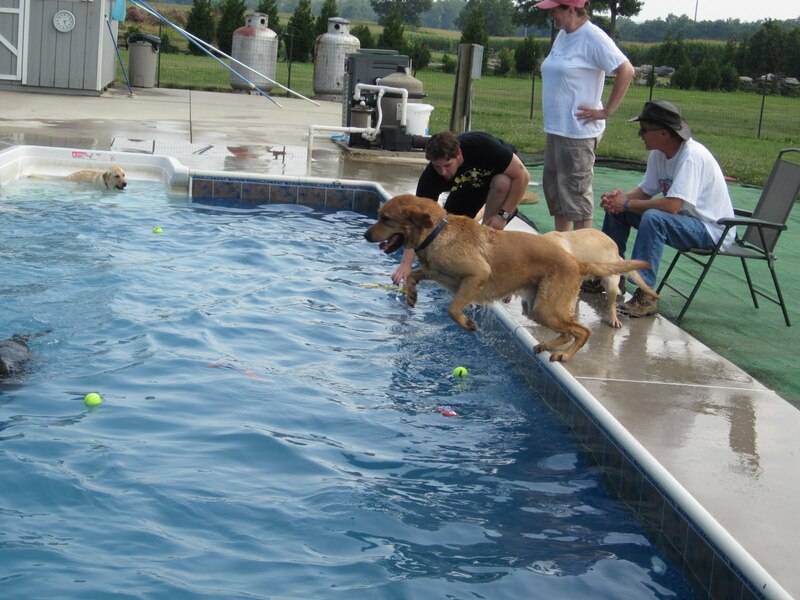 Sun Hill Kennels is open to the public, but they ask that you call ahead to make an appointment first. The pool is a popular spot in the summer, and they take care to make sure that it doesn't get overcrowded. The Harrisburg area is under an excessive heat warning, and temperatures are breaking 100 degrees. Most people try to stay inside as much as possible, but if you have a dog, you know that you'll have to brave the heat at least two to three times a day. Here at SSD, we're in our last day of summer camp, and although we're trying to keep the campers and dogs in the air conditioning as much as possible, sometimes we just have to be outside. Give your dog lots of water. 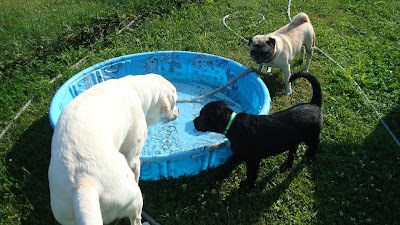 When you go outside, always make sure that your dog has access to cool, clean water. 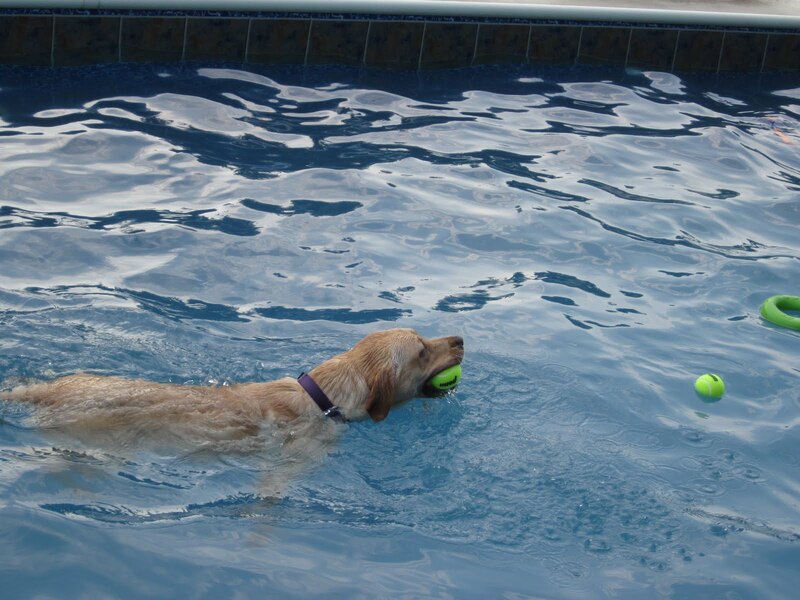 Your dog can quickly get dehydrated in this heat, and they'll need lots of water. Stay in the shade. When you take your dog outside or for a walk, look for a nice, shady route. Avoid walking on asphalt, which can get extremely hot and burn your dog's paws. Always test the street or sidewalk before starting on your walk. If it's too hot for you to walk in your bare feet, then it's too hot for your dog to walk on it in his bare paws. If you must walk on asphalt, consider getting booties for your dog to protect his paws. Don't leave your dog in the car. We cannot say this enough. Don't leave your dog alone in a parked vehicle. The inside of the car can get hotter than an oven in a matter of minutes, and your dog could have a heat stroke and could even die. In the hot summer months, it's better to leave your dog at home than to bring them along as you run errands, no matter how short you think it will be. Be careful while swimming. 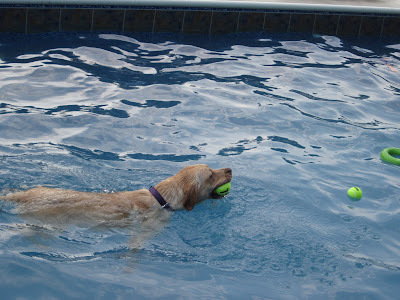 Swimming can be a great way to cool off in the heat. Many of our dogs in training love the water. 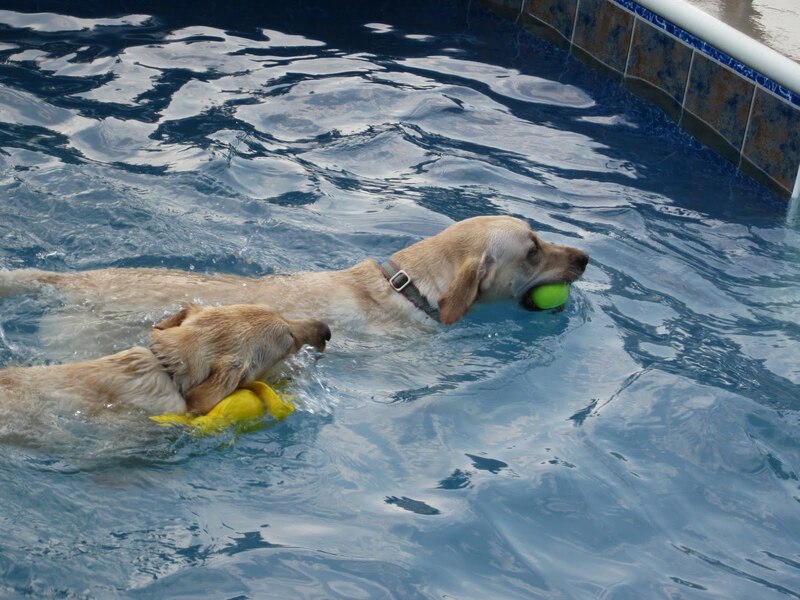 Just make sure to always keep an eye on your dog while he's swimming, no matter how good of a swimmer he is. 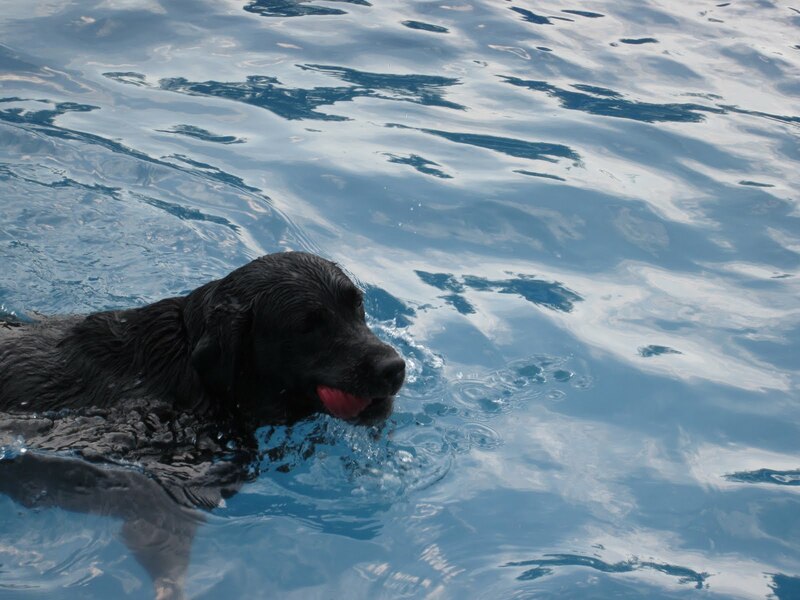 After swimming, rinse your dog with cool, clean water to get rid of the chlorine or salt. Dogs can get sick if they ingest these chemicals. Try some frozen treats. There's nothing better than an ice cream cone on a hot summer day! Your dog may enjoy some frozen treats, too. While dogs can eat ice cream (except chocolate! ), it can upset their stomachs. If you're going to give dogs ice cream or other frozen treats, don't overdo it. The simplest thing to do is to just give your dog some ice cubes. Many of our dogs in training love ice, and some even play with the ice cube before eating it! While you're busy making sure your pet is safe in the heat, don't forget about yourself! Drink lots of water, take a refreshing dip in the pool, stick to the shade, or relax in the air conditioning during the hottest part of the day. We hope you and your pets have a safe and fun summer! 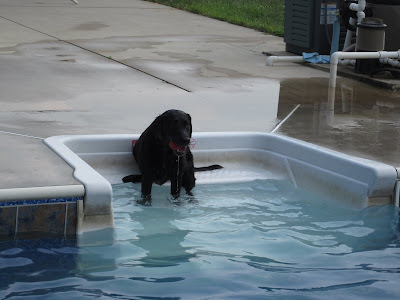 Read more about pet safety in the heat. 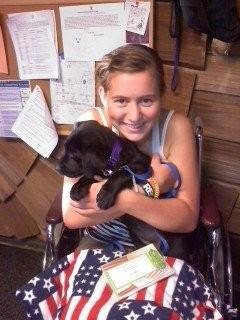 The American Heroes puppies have joined their puppy raisers, and SSD Clara Hale traveled to the Northeast group! She's being raised by Nubble's puppy raiser, Donna. Donna and Lindsey picked up Hale from the kennel last Friday. Although Hale cried the entire ride home, just like her brothers and sisters did for their puppy raisers, she settled in well enough at home to sleep through the night. She must have tired herself out because she only woke up once to to go outside and "get busy." In fact, she has been sleeping through the night every night and she tends to wake up around 7 a.m., which is great. "That means that I am that much more able to be attentive to her," says Donna, "because I'm not exhausted from lack of sleep." That first night, Hale met Gizzy, the family dog, and Nubble, who has come back to live with Donna and her family. They gated off the living room so that Gizzy and Nubble could greet her through the gate, and the dogs spent the rest of the evening that way. In the morning, Donna took Nubble and Hale outside to greet each other, and it went very well! Then Gizzy and Hale met each other, and it went much better than Donna was expecting. Soon, all three of them were doing wonderfully together. Nubble absolutely loves Hale. He lets her climb all over him and chew on him. They play tug of war, and Nubble is very gentle with her. They even play with the same bone! Gizzy is also enjoying having someone her own size to play with, and all three dogs race around together. Yesterday, Donna put some ice cubes on the floor and the three dogs, plus Donna's brother's dog Rocky, ran around chasing the ice. 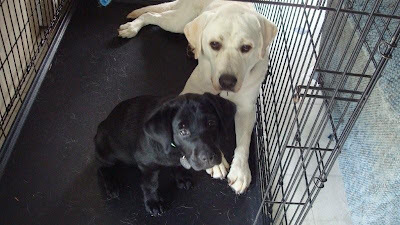 Hale and Nubble are best buds. Nubble tries to escape to his crate when Hale plays too rough for him. It doesn't always work. Hale likes drinking out of the hose, but she's not too keen on getting in the water yet. Hale has already visited many public places already, although Donna is sticking to businesses without carpeting until she's more confident with Hale's housebreaking. So far, Hale has visited Pizza Hut, where Donna works, and Lowe's. Lindsey carried her into Wawa, and she took a very short trip to Redner's grocery store. Donna is keeping the trips very short, which is good because it sets Hale up for success. Hale went to her first puppy class with the Northeast group and met SSD Ben, Cassie, Fred (a black, standard poodle puppy), Phoenix and Lewey. Hale and Lewey are just about the same size and they get along well. They went to a dog demo at Toybhanna Community Days on Saturday, and she met SSD Slate and SSD Sky, who are both in advanced training. 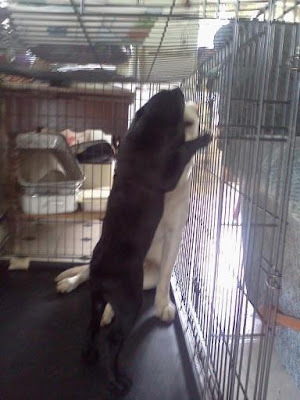 Donna plans to expose her to as many different dogs as she can so she is comfortable being around strange dogs. Donna and Hale worked on greetings at Tobyhanna Community Days, and while Hale has a good start on them, Donna plans to regularly practice greetings. Hale is very much a puppy, and she does have a feisty streak. Hale and Lewey take a break together at Tobyhanna Community Days. Hale met all of Donna's cats. She is Baby's (the cat) size, and Baby already walks with her and lets her climb all over her. Hale is quite calm around cats, but she also doesn't seem to fear anything. One time a car door slammed, and instead of jumping away from the noise, she jumped toward it. She will also just walk right up to Donna's goats without even blinking. She is learning very quickly. As long as Donna holds her attention, Hale soaks up new behaviors and cues like a sponge. She already sits nicely for her food. It did take her a few meals for her to figure out that she won't get her food if she barks at Donna or swipes at her or the food bowl with her paws. She caught Donna by surprise the first time she pawed at the food bowl, and she knocked the bowl right out of Donna's hands! But after that, Donna worked with her and now she sits nicely. Most of the cues we teach our dogs involve both a verbal cue and a hand signal. Donna has noticed that Hale will sit with the hand signal, but if she gives the hand signal too far above Hale's head, she gets bored and loses interest. She's learning "down," but she tends to dig with her paws as she moves into a down. When Hale can't figure out what Donna is asking, she jumps at her and barks or puppy growls. Although the behavior is cute, Donna isn't letting her continue it. Behaviors such as jumping on people and barking are very cute coming from a puppy, but if that behavior is allowed to continue, soon it'll be a 60 pound dog jumping and barking - which is not nearly as cute and can actually be dangerous. We train our dogs to keep all four paws on the ground (unless cued otherwise). Hale definitely knows her name, and she enjoys practicing recalls. She is also learning "stand," she loves doing "up" (putting her front paws on an object on cue) and she knows "off" (getting off furniture or other objects). Donna is working on hand targeting, and Hale will touch her nose gently to Donna's hand without trying to chew on it. She also takes her treats very nicely without being sharky (using her teeth excessively). So far, Hale doesn't really chew on things that she's not supposed to. This time, Donna is keeping lots of rope and chew toys and bones around so Hale always has an appropriate item to chew on. At first, she thought the clicker was also a fun thing to chew on, but now she has realized that it's not a toy. Hale helps with some interior decorating. 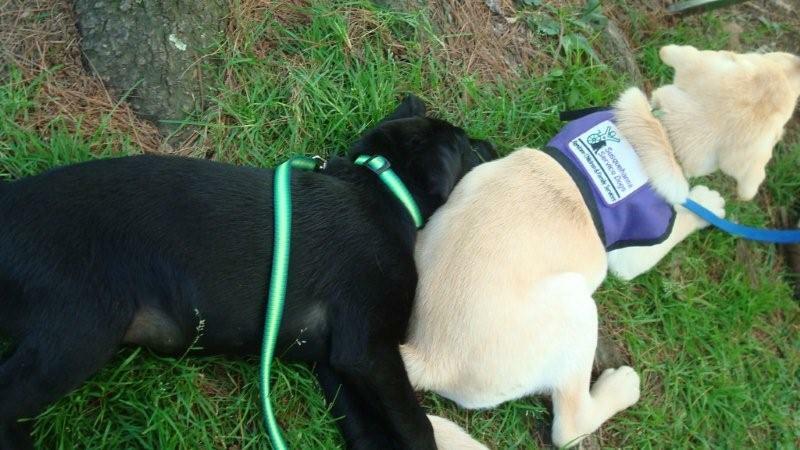 Each dog has their own personality and temperament, and Donna has noticed that Hale and Nubble are very different dogs. "Both are great in their own way but they're definitely very different," she says. 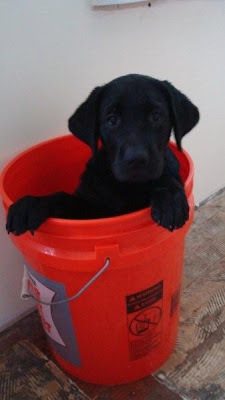 We can't wait to learn more about SSD Hale and her progress with her puppy raisers!